We hope that you all had a wonderful holiday season and have been getting acclimated to the New Year, especially getting past writing 2018 on everything! 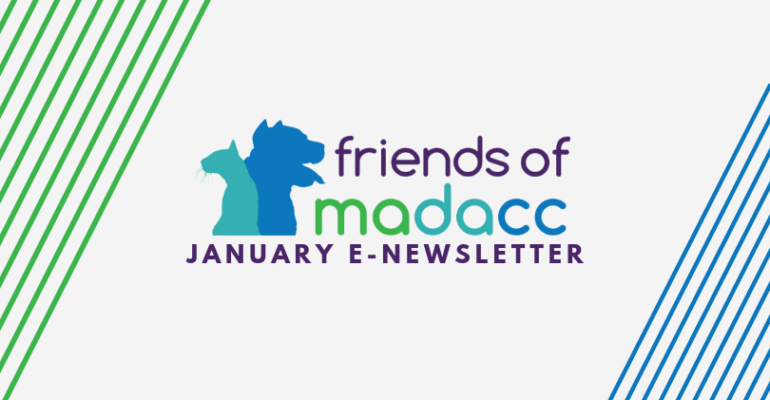 It’s hard to believe that 2019 is now upon us – We at Friends of MADACC have already begun preparing for all of the wonderful events we have in store for 2019. There will be some oldies (but goodies) including the 2019 Pet Expo on February 2 nd and of course the 8 th Annual Walk Run Wag on July 13th (it’s not too early to begin daydreaming of Summer in Milwaukee, right?!) as well as some new events to stay tuned for. On January 12 th , Central Bark West hosted our first shot clinic of 2019 and it was a huge success. In just one day we provided the same amount of services as our last two clinics combined! If you missed it, don’t fret. We will have three more this Spring/Summer! All of these events, as well as your donations, make what MADACC does possible. We talk about (and promote) these events a lot. Because the truth is, they’re so important in our overall mission. Over the holidays, MADACC ran two major promotions; Adopt a Butterball Thanksgiving promotion and 12 Days of Strays, in which Friends of MADACC was able to supplement the cost for adoption fees. Between these two events, we were able to help MADACC adopt out 117 cats and 27 dogs for a total of 144 animals that spent their holidays in a cozy new home. That is all thanks to our donors and supporters, as well as our volunteers. We are so appreciative of all of you and your continued support and look forward to seeing what this year brings. Thank you to Bark N’ Scratch!